a picture-book setting ... we offer you Eastern India. Popular with those who have past links with the region, the tour also attracts many first time visitors -some take the North India Option to complete the picture. Darjeeling and Calcutta, names that evoke fond memories of the Raj, are combined with the quaint hill-state of Sikkim, known for its Buddhist influence and numerous orchids. This tour is for relaxation in the serene Himalayas and for those who value romance and nostalgia. 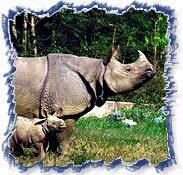 We end with a search for the one-homed rhino, in the foothills of Assam. We have used the best available accommodation everywhere. In smaller places the hotels are comfortable but simple. All have en suite facilities. The internal travel is by flights, coach/car/jeep (air-conditioned in Calcutta) and by reserved sleepers in trains. You will meet our representative and transfer to hotel. Early morning we visit the flower market on the riverbanks in Howrah. This is followed by a boat-ride on the Hooghly. The afternoon sightseeing of the metropolis includes the imposing Victoria Memorial, St Paul's Cathedral and the Indian Museum that houses one of the best collections of Indian art. In the evening we transfer to Sealdah station to board the Darjeeling Mail and spend the night in the comfort of air-conditioned sleeper. On arrival at New Jalpaiguri in the morning we board the "toy train" for a romantic journey up the hills to Darjeeling. A favourite hill-station of the British to escape from the heat of Calcutta, Darjeeling is surrounded by tea gardens and has magnificent views of the snowy peaks of Kanchenjunga. Overnight in hotel. Early in the morning we drive up to Tiger Hill (9000 ft) to see the spectacular sunrise over Mt. Everest and Kanchenjunga, visiting the Ghoom Monastery on our return. We later visit the Himalayan mountaineering Institute and a local tea garden. A scenic drive (120 kms. / 15 hrs.) will take you to the remote halmet of Pemayngtse but simple accommodation. The afternoon is free to take in the natural beauty and to visit the local monastery. We drive to Gangtok (112 kms./4 hrs.) 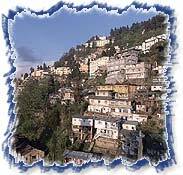 the capital of Sikkim and check into the hotel. The remainder of the day is at leisure. The sightseeing of Gangtok today includes the royal monastery, Tsukla- Khang, whose interior is covered with murals and lavishly decorated altars holding images of the Buddha, Bodhisattvas and Tantric deities. We also visit the Namgyalak Institute of Tibetology, the Orchid Sanctuary where many of the 454 species of orchid found in Sikkim can be seen, and the Rumtek Monastery, noted for its carved and painted woodwork. Another pleasant drive bring us to Kalimpong (85 kms. / 3 hrs.) where we stay at the delightful Himalayan Hotel. The day is free to visit the orchid nurseries, churches and monasteries. 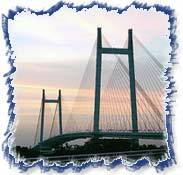 We transfer to Bagdogra for a short flight to Guwahati in Assam. A two-hour drive takes us to Shillong. Late afternoon we visit this "Scotland of the East" where the British and wealthy merchants from Bengal built cottages, polo grounds and golf course. Today we drive to Kaziranga National Park that lies on the banks of the mighty Brahmaputra and is famous for its one-horned rhino. It is also home to the wild buffalo, swamp deer, tiger, wild elephants and the badger apart from being rich in bird-life. We fly back to Calcutta for overnight stay. The afternoon is at leisure perhaps to visit Mother Theresa's mission. Overnight at hotel. The day is at leisure. In the evening we transfer to the airport to board our return flight (hotel checkout 1200 hrs. ).